The last time I renewed our passports, I thought I could save some money by shooting the required photos. How hard could that be? It’s just a head shot taken with a neutral background. It turned out that the government has some pretty strict rules about what qualifies as a passport photo and I wasted time and money by giving it photos that got rejected. If I wanted do-it-yourself photos, I should have checked out Passport Photo Workshop. The Windows program is designed for use by amateurs in a home, business or organization. 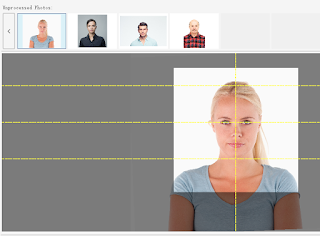 It has a step-by-step wizard interface that walks you through the process and provides dozens of passport photo templates and a set of simple editing tools. Among the program’s features is an Auto Crop option that will automatically recognize facial features. Cropping can also be done manually to produce photos that meet ISO/ICAO standards. Users can input images from files, a webcam, SD cards or Canon’s EOS series digital cameras. It also supports a variety of output options.